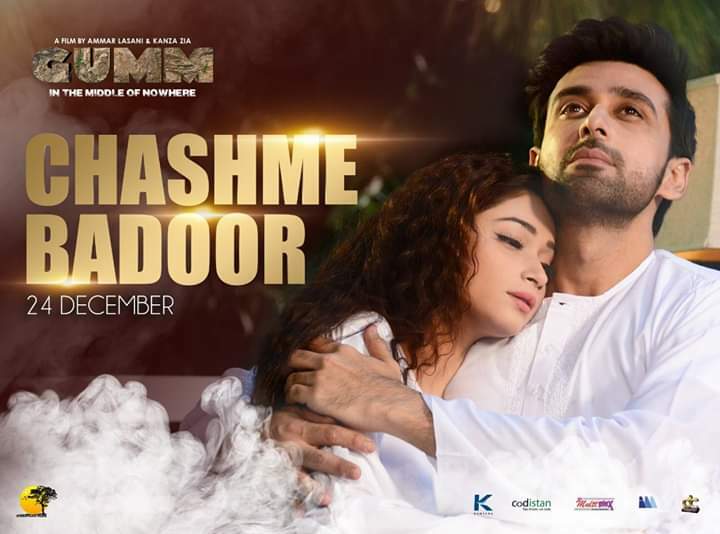 “Chashm e Badoor” belongs to the crime thriller Gumm .The song is picturised at beautiful serene outdoor locations that make you want to be there. Being as unbiased as we can be, visualisations of existing Pakistani movie soundtracks contain a “Bollywood-touch”, where all we see is the girl and guy singing their lyrics. Whereas, Chashm-e-Baddoor didn’t illustrate that at all. It has an exquisite, yet unique flairs from the first scene to the last – giving it a novel expression. The look on Sami Khan’s face says it all; his eyes reflect hope, passion and contentment, making it utterly “the perfect display of true love!”. Shameen Khan running across the field of silk curtains is one of the best parts of the song with a hint of magic and was marvelously captured. Further, authenticity was filled in Sami’s performance of cooking in the kitchen. Its the flawless cinematography that makes it more impactful. The addition of the light motifs, most probably only for promotional version of the song, added to the beauty of the track. Everything is perfectly in place because it’s all so desi rather than being borrowed from some other industry. Moving on to the music, the overall feel of the soundtrack is soft, sweet and joyous. The music gives the feel of innocence, intimacy and purity, combined. It is rightfully entitled the “Love Anthem of the Year!”. Switches of the music from the use of mouthpiece to drums, and from violin to guitars are impeccably sited. The musicians let the harmonica/mouthpiece shine through, which in return let the music sink in deep inside of each and every listener is bound to make you skip a heartbeat. Furthermore, they gave it a contemporary and edgy feel with the guitar. Directed by Ammar Lasani & Kanza Zia, the “Gumm”s cast includes Sami Khan, Shamoon Abbasi, Shameen Khan, Anjum Habibi, and Alizey Tahir. Film is all set to release in theaters nationwide on 11th of January, 2019.